The first online DoveTales will launch on August 1st, 2019, and will include our Young Writers Contest Winners. Our Guest Editor is Writing for Peace Adviser Patricia Jabbeh Wesley, and she has chosen the beautiful theme “One World, One People.” Reading for this journal will open February 1st, 2019, and close on June 1st, 2019. DoveTales, An International Journal of the Arts is an extension of our mission to promote writing that explores the many aspects of peace. Our goal is to expose young writers to a diverse collection of thoughtful works by our advisers, established, and emerging writers. 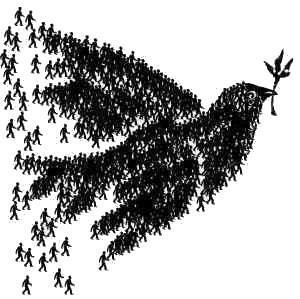 DoveTales includes art and photography, as well as poetry, fiction, and nonfiction, occasionally including interviews with writers and individuals working to promote peace through environmental, human rights, and social justice activism. Thank you so much for the new “Empathy” issue. I am surprised and humbled to see my photo as the cover of this year’s issue. Thank you so much. I am so pleased to be a part of your noble effort. The book arrived yesterday, but already I am enjoying the excellent editorial choices. Your photographs are all beautiful, but the cover photo is the perfect image of the ever widening embrace. Thank you so much for sharing your work with us!